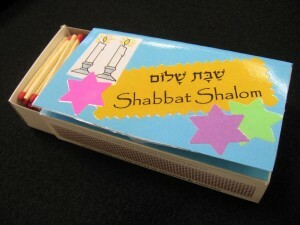 Include your children’s art every Friday night by lighting your Shabbat candles with matches from a decorated box. In this matchbox, the blessings are included in Hebrew, English, and transliteration. Making the box is simple. Fold the blessings sheet and attach it to the top of the box with glue. Children can add stickers and other decorations.